The sun setting down amongst the white, blue clouds glistening the sky with the golden glow is breathtaking in the charming land of Rishikesh. Here people witness the sky turning into a brilliant spectacle of color as the scenery soothes the soul in a charismatic manner. “Clouds come floating into my life, no longer to carry rain or usher storm, but to add color to my sunset sky.” ~ Rabindranath Tagore. For many, the sunset is a natural phenomenon representing the end of the day. But, for the people of Rishikesh, the sunset is beautiful and special. It is an epitome of fleeting beauty that paints the sky in bright hues, coupled with the calmness of the silvery sky comforting the soul by the banks of the Holy Ganges. With time in Rishikesh, India there are plenty of adventures and sunset watching points where the moment can capture the heart forever. Experience the soul-soothing feeling at the Triveni Ghat. At sunset, the numerous illuminating lamps cast a shadow of calmness making you feel that Rishikesh is the land of Gods and Goddesses. Hundreds of people gathered at the Triveni Ghat to experience the Ganga Aarti in the evening enlivens the spirits of the crowd in a single harmony. 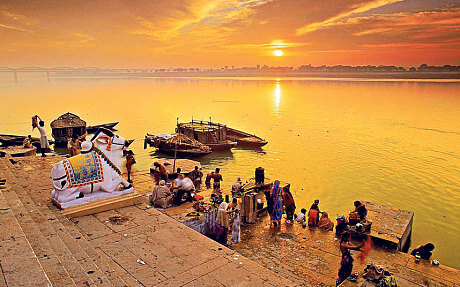 An amazing experience awaits visitors here as the incredible colors of the sky radiate through the Ganges. 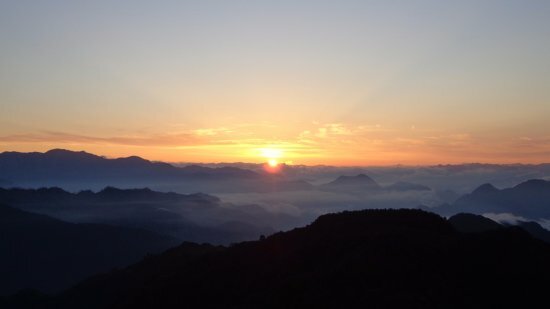 Marching towards the Kunjapuri temple set against the picturesque Himalayan ambiance is a chance to view the sunset among the panoramic views of the lush Himalayan peaks. Feel a sense of closeness to nature and self in the temple is well-known for its unblemished natural splendor and serenity. Admiring the misty peaks of Gangotri, Swarga Rohini, and the Doon Valley at sunset. Head out to have the breath of fresh air on the Lakshman Jhula- swinging crossover bridge of the town. 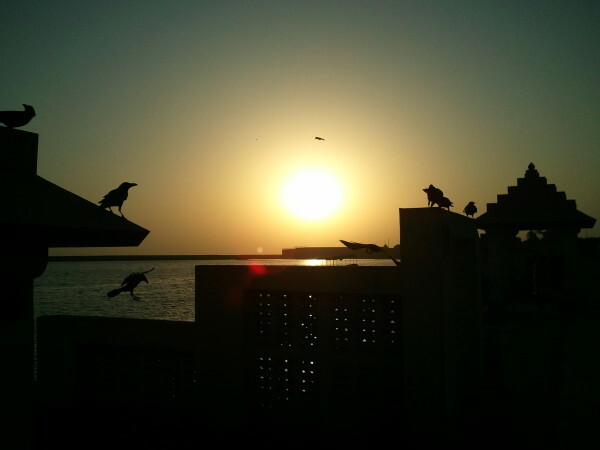 The stunning vistas of the town with the flowing Ganges beneath and the sun setting at the horizon is a mystical treat for the eyes and soul. The shining golden rays against the cloudy sky captivate the viewers hooking their senses to the natural beauty– which rarely the people living in a city get to experience. 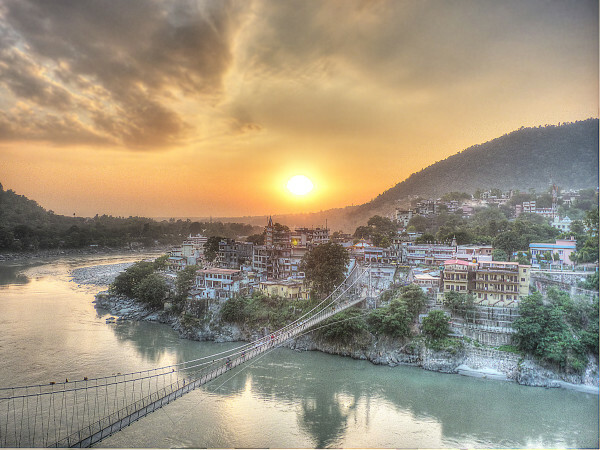 Rishikesh offers visitors a chance to watch the sunset unfold over unique and historic landscapes. In this part of India one can witness the glorious hues of orange, gold, crimson, and red wash the sky leaving the viewers stunned with the grace and beauty that manifests. Adore and submerge in the marvelous beauty of the sunset in the fascinating land of Rishikesh and enjoy its warmth making your mind quieter and quieter.